Jesus answered him, “It is also written: ‘Do not put the Lord your God to the test.’” Matt. 4:5-7, NIV. Also see Luke 4:7-12. Note: Both Matthew and Luke record this incident in the life of Christ; however, they list the last two temptations in different orders. Matthew lists this one as the second temptation [which is where we have placed it] and Luke lists it as the third one. Obviously, historically it must have happened in one order or the other. Why the change? When looking at situations like this we must remember that the gospel writers were not writing a biography of Jesus or even a history of events. Each writer, under the inspiration of the Holy Spirit, was including or excluding events in the life of Christ to prove a certain point. Details were NOT falsified or left out to give an incorrect impression but simply some are left out because they are not relevant to the point being presented. And, in this case, one of the writers arranged the temptations in different order - not because he did not know the historical order but to emphasize his point. 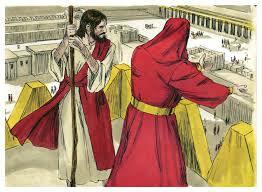 Matthew, writing mainly to Jews, states that satan took Jesus to the “holy city.” All Jews knew what that was! Luke, writing mainly to Gentiles. identifies the city as Jerusalem. Once again we notice the little “If” word. At all costs, satan is trying to get Jesus to doubt Who He is. If even one little doubt was able to get a foothold it would grow and destroy Him and His mission. So in each temptation Satan tries to get Jesus to “prove” Who He Is as if He or satan had any real doubts! Beyond that, what was the temptation here? The first temptation had been to be independent by turning stones into bread, but wasn’t this showing trust and faith in the Word and promises of God? Satan did not misquote quote Scripture. That was indeed what the Word of God promised [See Ps. 91:11-12]. Many Christians have memorized and claimed this Psalm over the years. Why could not Jesus use it now, prove God’s protection and silence satan’s innuendos. Would that not bring glory to God and validate His ministry? The temptation here was to act in presumption. Presumption is where we - consciously or unconsciously - try to manipulate God to do what we want Him to do. Yes, satan did quote a real promise of God, but now was not the time for its application. A promise of God is given for a time of need and purposes of God not to be used whenever we feel like it. If Jesus had jumped from the pinnacle of the temple He would have been tempting or testing God. He would have been acting in rebellion attempting to manipulate the Father into doing His will instead of being in submission to the Father’s will. Whether the Father chose to save Him or not, the ministry of Jesus would have failed and He could never have become the Saviour. When we claim a promise of God, we need to know the will and timing of God. Genuine faith in the promises of God will bring results, but acting irresponsibly and expecting God to save us is testing God and will end in tragedy. The Word of God is not a Book of magic spells that we can use to get God to do our will and yet that is how presumption is ultimately viewing it. We study the Word of God to learn His will and what He is willing to do. And we listen for His voice to know what is appropriate in any given situation. God will never contradict His Word, but we need to know which Word to apply in which situation. This comes from knowing God. We are not to be judging and testing God. God judges and tests us. Presumption tries to put us in control. Faith rests in the sovereignty of God and walks according to His will even when it appears the promises are failing. And we also have to realize there are general promises as well as specific promises. A general promise is that children who obey their parents will live long lives [Eph. 6:1-3], but that does not happen in every specific case. It is the general will of God. God has also promised that all things work together for good to those who believe [Rom. 8:28]. This specific promise is true all the time, but what is not promised is that we would see and understand how everything is working for good. Another way that some have fallen into this temptation and acted presumptuously by testing God is through a false understanding of eternal security. A person who is truly born again cannot be unborn. They are a child of God forever. To believe that a person can lose their salvation is to bring fear and doubt into their lives. However, to say that because a believer is eternally secure he can live anyway he wants without consequences is a presumptuous error. Sin will always have consequences in this life and unrepentant sin will have consequences in the life to come [1 Cor. 3:11-17]. Of course, if a person claims to be saved but continues to pursue a life of sin then they have a false security not an eternal security. A true believer wants to follow God and be pleasing in His sight no matter how many times they are tripped up by satanic traps and the old nature. How did Jesus answer Satan’s manipulative use of Scripture? With Scripture in context. Scripture always balances Scripture. Most error in the church is either overemphasis on one topic or taking one teaching to extreme without looking for and apply balancing Scriptures. Of course, in order for Jesus to be able to come up with the balancing Scripture in the time of need He had to have been previously familiar with Scripture.